Fall is my absolute favorite time of year. 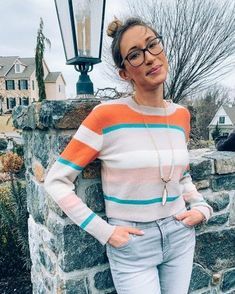 From the colors to the crisp air to the pumpkin spice everything, I love it all! 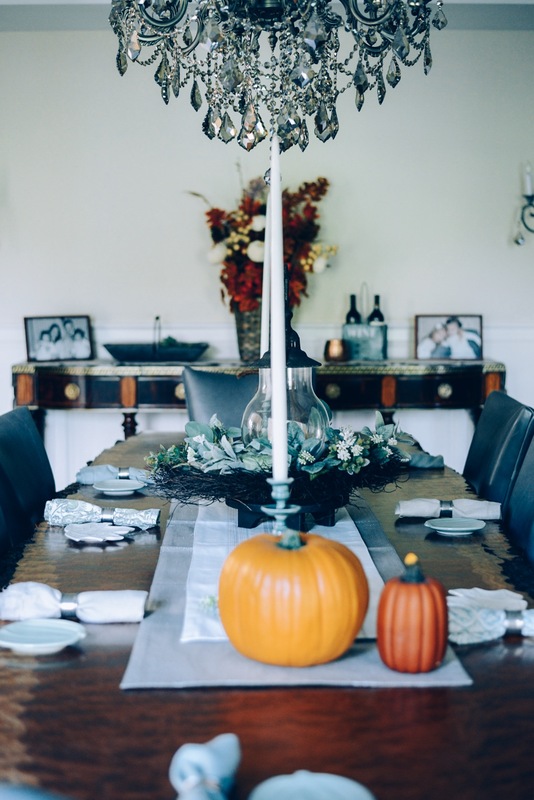 And since we just entered my favorite month, I thought I’d share how I decorated my home interior for fall! 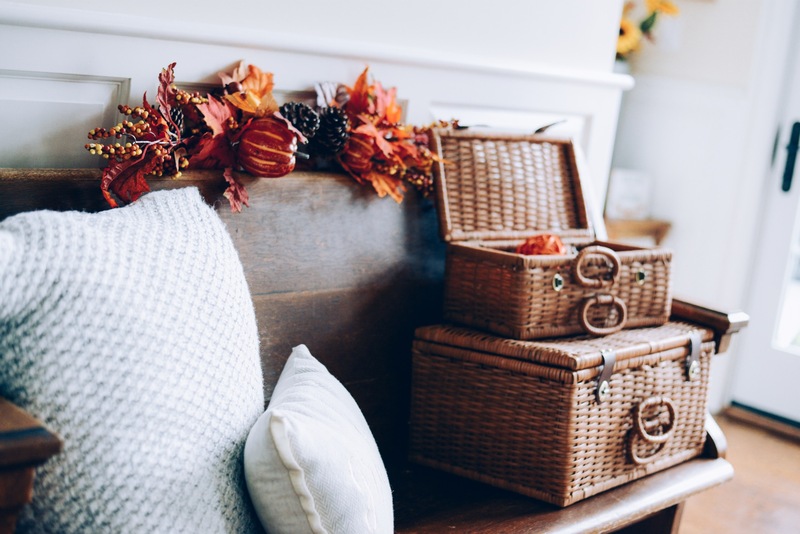 Isn’t there just something so cozy about fall décor?! We visited a pumpkin patch over the weekend, but I don’t quite have my porches ready to show you. I need to pick up some mums! So stay tuned for that! I didn’t photograph every single element of fall décor. 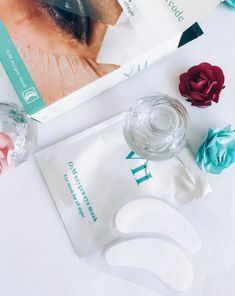 Think of this blog post as a highlight reel! I gravitate towards rustic touches in my home, and I prefer to mix white pieces with various textures to keep things interesting! 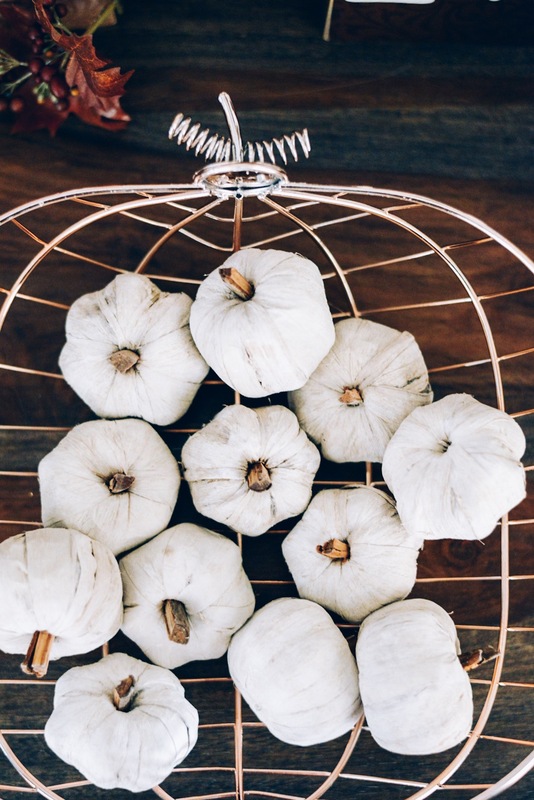 These little cloth pumpkins look great with the distressed white wood, galvanized metal, and glass pieces on our oven hood! Baskets are a fresh alternative to glass vases. 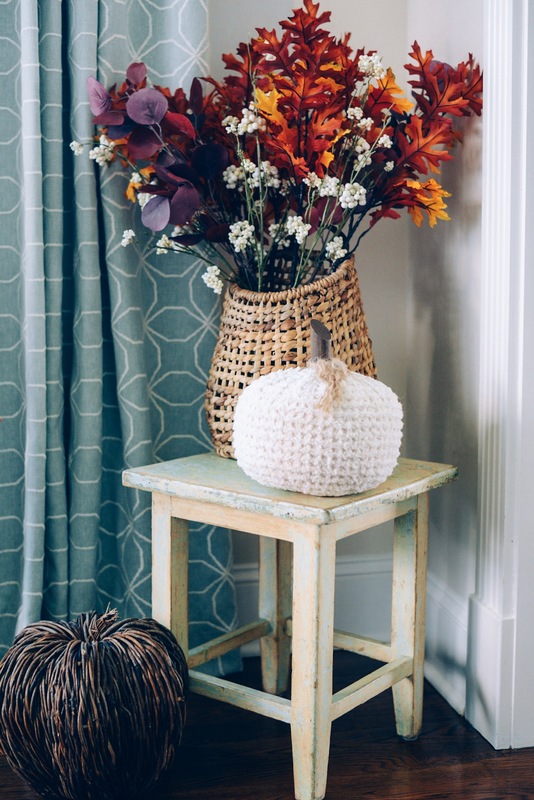 This cute canteen-inspired basket is the perfect container for this faux fall foliage! I added a wicker pumpkin and a plush textured pumpkin to bring out all the colors in the foliage. 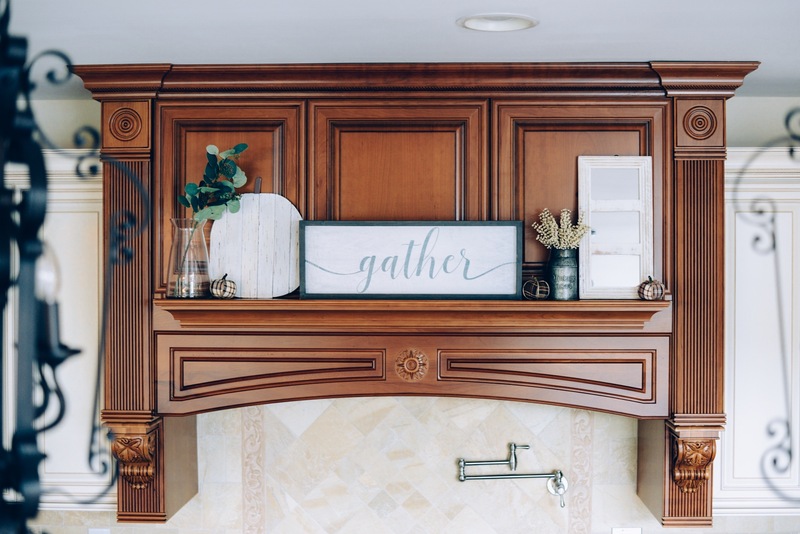 The little distressed stool sits in the corner of of our breakfast area, and I adjust the décor that sits atop of it according to the seasons. 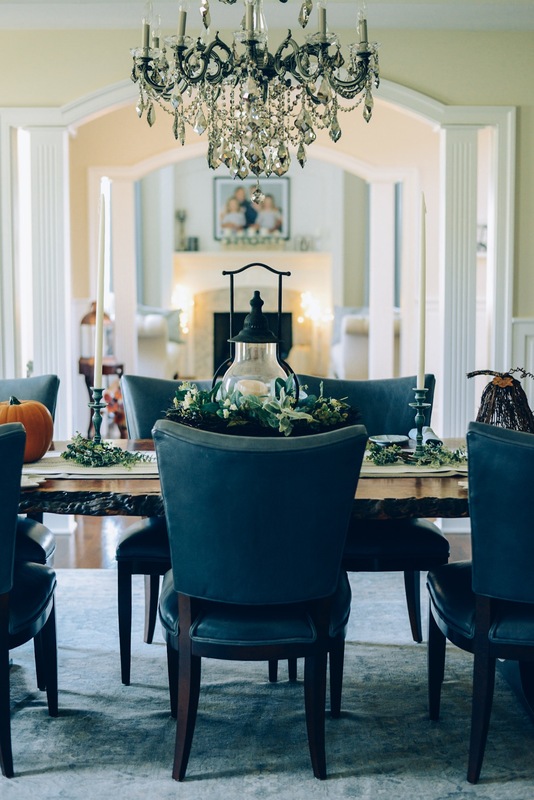 This formal dining room is a work in progress for us. We still need to find a large painting that we absolutely love to go on that blank wall. I display the eucalyptus wreath around the lantern all year round. It’s important to have a centerpiece that fits into any season so that you’re not always scrambling to find a seasonal centerpiece. Although I think it’s totally fine to switch it up as well! Likewise, my white pre-lit birch trees compliment any season as well! 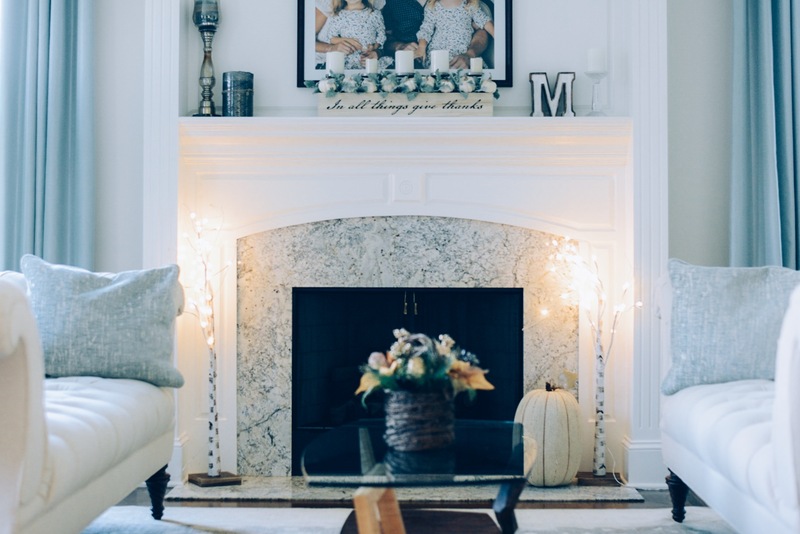 It’s so nice to be able to leave them out all year to create a cozy atmosphere during any season! I kept the mantle pretty simple here. Sometimes, less is more! This is our main foyer. 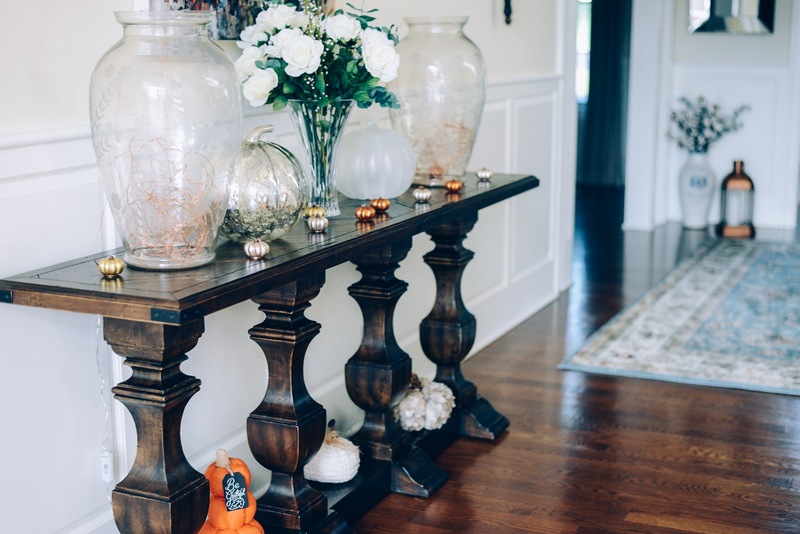 My 4 year old girls “helped” me decorate for fall, and I honestly would have never thought to set the pumpkins at the bottom of the console table! I love it! It completes the fall look. The copper wire lights illuminate in the evening, but I preferred to photograph the urns while the lights were off. This bench is from an old church in Minnesota. My husband’s family is from there, and his great great grandfather built the church (and the pew!). I enjoy being able to have an antique bench in my foyer (It faces the console table in the foyer, but not head on.) that carries so much meaning! The bench is a place for seasonal décor all year long. I was lucky enough to snag the basket trunks at a local consignment shop for $15 total! But I’ve linked similar (new) baskets at the bottom of the post. 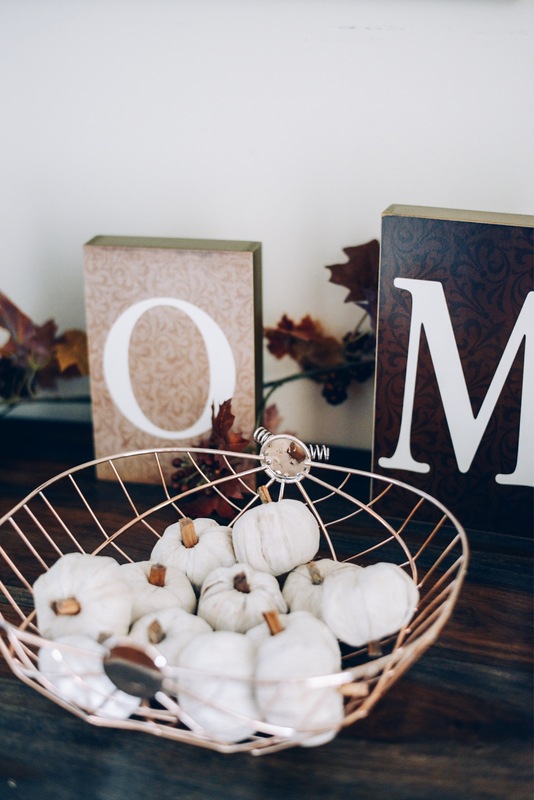 Can you believe I found the cute wire pumpkin-shaped basket at Target Dollar Spot?! That place gets me every time! Anyway, this desk is in our mudroom entryway, so it’s less formal than our foyer. I made the desk extra cozy and homy so that when we walk in from the garage, we feel comfort. The desk is more decorative for us than anything, but in the future, I envision it as a homework desk for our girls. It sits right outside of our kitchen, which is where I spend most of my time, so I would be able to help them in an instant. 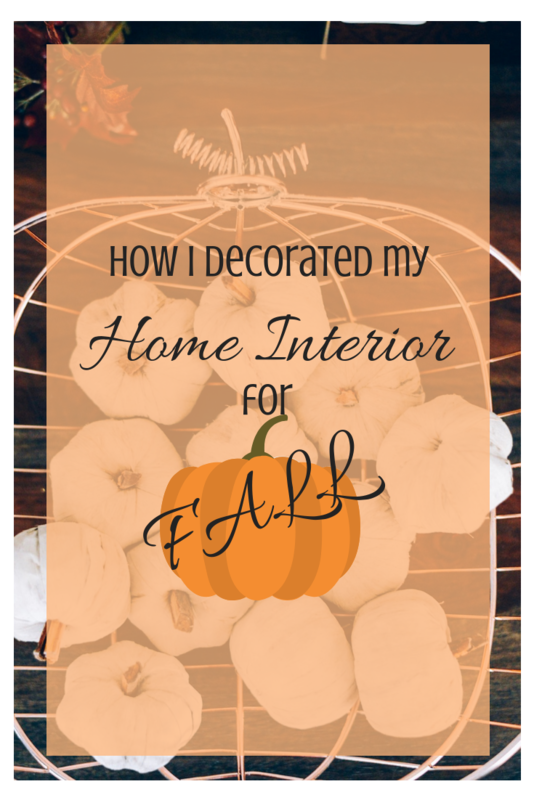 Keep an eye out for my exterior fall décor! Which season do you like to decorate for most? Follow me in the LIKEtoKNOW.it app to see exclusive outfits, décor, and more! Stunning decor girl, I love the more white chic style! Thanks so much!! Me too! Your entry way is so beautiful and that church bench is incredible! Thanks so much! We had that space empty for so long, so once my husband told me we were getting an old church pew, I knew just where to put it!! Thanks so much for the kind words. I’m glad you like it all! Amazing decoration ideas, your house looks so beautiful!!! So when can I come visit… bahahah!! Absolutely love what you’ve done. It looks festive yet cozy I’m obsessed!! I love your fall decor! I haven’t bought some decors yet for this season. Hopefully, soon! Thank you! Fall is so fun! Your space is so incredibly welcoming and warm! I’ll be on the lookout for your outdoor decor! I found the cutest foliage at Crate and Barrel! I don’t put nearly as much effort into decorating for any other season like I do for fall and Christmas. 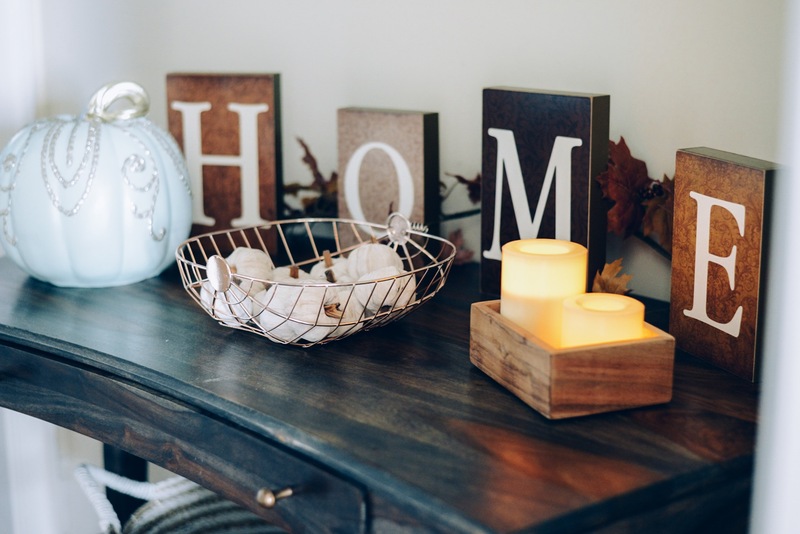 Such gorgeous pieces for fall decor. I think these could be done up in multiple ways which makes them all the more versatile and useful too. Thanks for sharing. I love all the fresh greenery you included. Fall is such a great time to bring the outside in. Thank you! Greenery is really important!